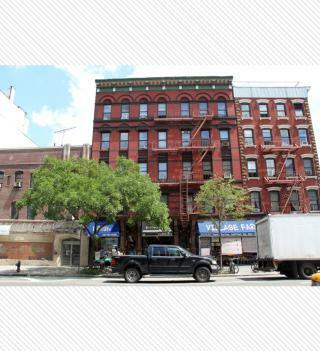 Building was constructed in 1878 and originally served as a tenement house. Building appears to have been recently renovated with commercial facilities on the ground floor and private homes on top. Businesses include a Local Grocery "Village Grocery" which sells organic and other healthy food alternatives and a local eye wear shop "Village Eye Care". Building's architect and owner is unknown.